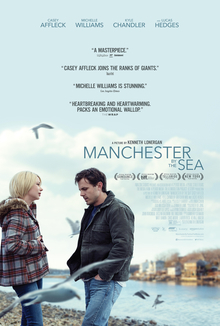 ‘Manchester by the Sea’ is an intensely moving drama that works primarily as a showcase for a superb Casey Affleck performance. He is Lee Chandler, a janitor in Quincy, Massachusetts, who is drawn back to his hometown when his brother (Kyle Chandler) dies of a heart attack, and he discovers that he is the intended guardian of his nephew (Lucas Hedges). For various reasons that are revealed throughout the course of the film, Lee isn’t equipped to take on this responsibility, and the strongest moments of the film focus on how he adapts to this situation. How Lee has became the man he is today is depicted through the use of flashbacks, and with each venture into the past we start to understand more about his character and it dovetails perfectly with the drama in the present day. If he hasn’t already, this should be the role that allows Casey Affleck to shake off the label of Ben Affleck’s lesser known brother. He’s been putting in some terrific performances for ten years now, with standout displays in ‘The Assassination of Jesse Jones by the Coward Robert Ford’ and ‘Gone Baby Gone’ (both in 2007) threatening to break him out, but ‘Manchester by the Sea’ is likely to achieve that. His performance is so intensely moving, and all the more remarkable for how many of the big moments require him to convey his emotions internally. The subject matter goes to some incredibly dark places and Affleck’s more than up to the task, but he’s also got a dry wit and the bond he has with Lucas Hedges’ Patrick is superbly developed (Hedges is also terrific). Affleck is great, but he’s aided by the sublime work from Kenneth Lonergan behind the camera and in writing the script. The script never sugar-coats Lee’s negative and often destructive behaviour, nor is it afraid to show him at his lowest ebb, arguing with strangers and lashing out uncontrollably. In the film’s key dramatic moments, the combination of strong writing and Affleck’s performance make for some genuinely affecting drama and it’s testament to this quality that he still remains a character worth rooting for. As his ex-wife, Michelle Williams doesn’t feature in a great number of scenes, but when she does, she’s also great. There’s one moment (seen in the trailer) when her character bumps into Lee in the street, and the tender and heartbreaking conversation that follows is beautifully moving as it shows two people irrevocably damaged by tragedy attempting to reconnect. The film has a lot to say about grief, and it says it well, but I particularly liked how Lonergan managed to infuse the script with moments of levity and sprinklings of humour that help to prevent the film descending into a depressing slog. There is one scene that takes this approach a little too far, when Patrick goes to visit his mother towards the end of the film and the humour feels a little too broad, but beyond that, Lonergan deserves credit for crafting characters who feel real and who behave in believably flawed ways. ‘Manchester by the Sea’ is a powerful drama about coping with grief and moving past tragedy, with an outstanding lead performance from an imperious Casey Affleck. Directed from his own screenplay, Kenneth Lonergan has created a superb drama from gruelling subject matter and this is an excellent film.